No time for wit, my backlog is piling up! Hit the jump for impressions and stick around for more all throughout this coming week because the new series won’t stop coming. Zetman is an interesting take on the superhero genre. Taking place in what I’m assuming is a near-future Japan, the plot deals with a young, homeless boy named Jin. After unfortunate circumstances, Jin finds himself transforming into some kind of very Japanese (in terms of design) superheroic creature. I’d say more, but I can’t really talk too much without spoiling the plot. It’s expected stuff, but it’s done so well that you fine folks should check it out. As far as aesthetics go, the art is interesting. It reminds me, appropriately enough, of something you’d see in an 80s-early 90s Japanese superhero comic. Realistic and rough is a pretty good way to put it. My biggest complaint with the art is that some shots look really dopey. Close-ups with someone gasping in shock, their mouth agape, don’t work terribly well. It’s nothing too bad, but I just hope the series doesn’t rely on a lot of these kinds of shots. I’m happy to say that the music is the first I can actually remember in a long time. The action scenes have this great, heavy beat throughout it. A fight toward the end of the episode is so incredibly hopeless that you’d think the series would lose its main character before he got to be badass. The ending theme is… interesting. I’m not a fan of the rap, but the female vocals are pretty good. It sounds like something that Lotus Juice would produce, kind of like the Persona 3 battle theme except not nearly as good. The characters are quite interesting, too. Jin is completely baffled about those unfortunate circumstances mentioned above because, well, he’s still an innocent kid. Relatively innocent, anyway. His (as a kid) sense of justice is less about doing what’s right and more about getting money so he and his grandfather don’t starve or anything. To be completely honest, it’s more realistic for him to act like this than to be a justice for all kind of character like Kouga, Jin’s closest friend and apparent future rival. I look forward to seeing how Jin changes his reasoning for justice (or perhaps vengeance) as he matures. Anyway, if you like superhero things or want something a bit darker and more serious, definitely check Zetman out. It’s not for everyone, but if you liked S-CRY-ed, you should find favor with it. As always, thanks for reading and have a good’un. 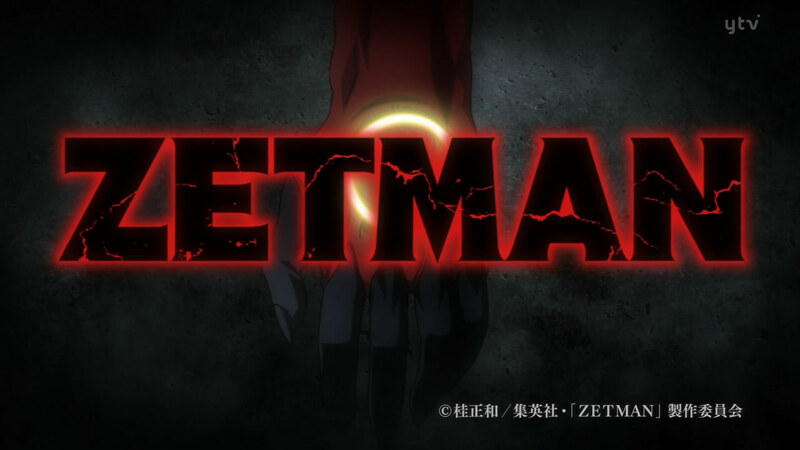 This entry was posted in Anime and Manga, First Impressions and tagged zetman anime, zetman episode one, zetman first impressions, zetman impressions. Bookmark the permalink. I heard the manga was good and I give this a try. The story isn’t bad and the battle part is quite good. Heck even the animation is quite decent as well. I’d like to see how Zet and the blue guy handle all this villains. This show is going to be interesting.